I haven’t been posting much because it’s been a little hectic around here. My parent’s (and their two dogs) moved in with us on Wednesday. There’s a possibility that the plumbing and furnace problems they had at their house this past winter are making them sick so we siblings decided they should hang out here while we investigate that angle on my mom’s serious lung problems. It’s been a bit of an adjustment for everyone (including the dogs) but we seem to be getting into a pretty good rhythm now, changing old habits and making new ones. The jumble of emotions we are all going through right now are so overwhelming that we try to just get through the next hour, that much we know we can handle. 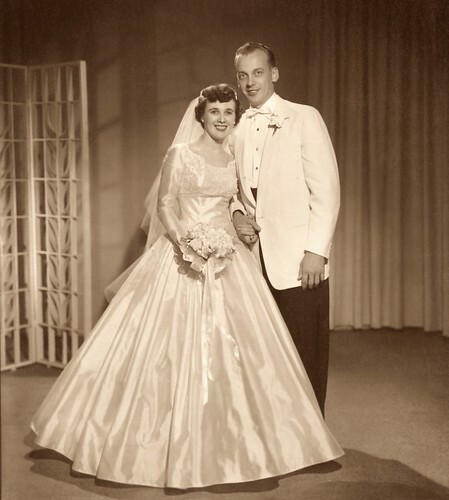 The photo is of my parent’s on their wedding day fifty-one years ago, for better of for worse, they’ve had both as all married couples do, with the betters far outweighing the worse. We’ll figure this out, do what needs to be done, for better or for worse…we’re in this together. This entry was posted in family, my life and tagged family, my life by Lilli Day aka bookbabie. Bookmark the permalink.